I sure do love this time of the year for so many reasons! but lets get down to one of my favorite reasons “comfort food” and “soups.” Oh’ Yes! 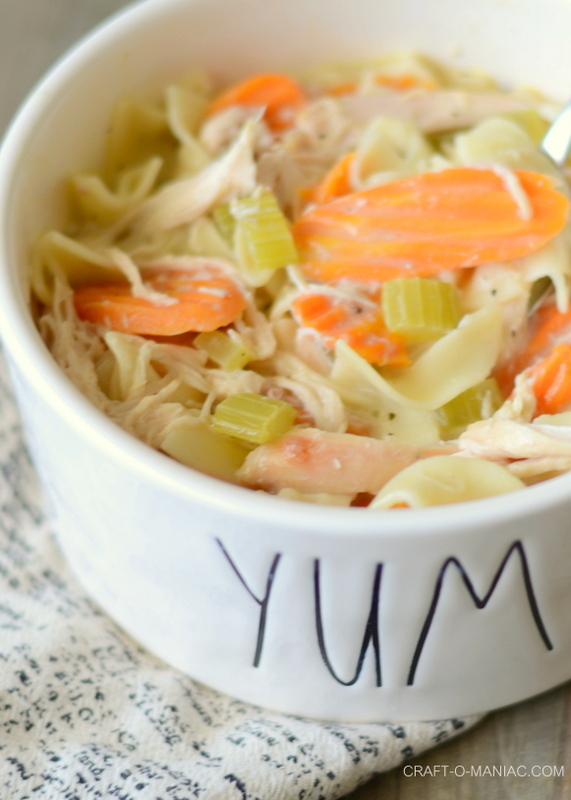 So today I am sharing a family favorite, Crock Pot Creamy Chicken Noodle Soup. Is there anything better in the colder months than a big bowl of warm creamy homemade soup? I don’t think so. My kids don’t even mind the vegetables in this soup, because the flavor is so good, they just gobble it all right down. If you are really talking comfort food, enjoy it with a favorite soft warm yummy roll. So I threw this baby together last night, without any recipe, and I was very pleased with how delicious it turned out. 4-5 Boneless skinless chicken breasts frozen. Or you can pull apart a Rotisserie chicken and put it in towards the end of the cooking process along with the egg noodles. I love it with the Rotisserie chicken like the pictures in the post. -4 carrot sticks graded chopped or use about a half a bag or carrot chips. (to be honest I didn’t measure the ingred. I just eyeballed them and shook away, taste and season more if needed.) Place your 5-6 boneless skinless chicken tenderloins or 4-5 boneless skinless chicken breasts in the crock pot. Place all the wet ingredients including the cream of chicken and seasonings in the crock pot, whisk them together. (TIP: I mix my milk and cream of chicken together first.) Place the frozen chicken breasts in the crock pot. Cook low 4-6 hrs. During that last hour of cooking add in your veggies, close and cook. During the last 15-18 minutes of cooking, pull out your chicken breasts out and shred with two forks or in your kitchen aid mixer. Then add the chicken back in. This is also when you can opt out for the pulled apart rotisserie chicken. Throw in your egg noodles too, and let them both cook during those 15-20 minutes. Now its time to serve it up… or should I say slurp it up. Thanks for stopping by, happy eats! MMM, I need a bowl of this warm cozy soup!! I am right there with you. This time of year has the best food, clothing, movies, decorations, weather, etc. Love it! Thanks for the recipe. Looks delicious! I offically want to eat this right now. OOh! My family wil be having this soon! Looks great! Thanks for sharing! Yummy! What size of carton did you use for the chicken broth? Also…I got my PACKAGE!!! 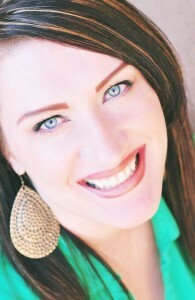 I’m taking some pictures to post on my blog and on your COM FB page. LOVE everything. Thanks again. How many ounces are in a carton of chicken stock? I’ve never bought it in a carton before. That’s what I’m talkin’ about right there! Yeah, I’m making it tomorrow! Come by all week for great recipes and tutorials. You could win the top prize or our giveaway for the week just by linking up. It is fabulous! Can you use fresh chicken breast? If so, would you know the time adjustment. Both my parents are sick and I would love to bring this over to them. Thanks! When do you add the celery and carrots? Wondering when you put the carrots and celery in?? For those considering trying this recipe, just so you know, if you only have a 3.5 qt crockpot you should half the recipe. I didnt realize it until after I had already mixed the wet ingredients. Still a great recipe and worth the try! I just wish I had done the math first! Making it tonight…looks delicious !!! Anyone know if this freezes well? Thanks for the recipe, glad we tried it. I wouldn’t call it “creamy”. It was definitely more of a stew than a soup, with very little broth. Also, the carrots remained hard, and I had to nuke them then add back. Also, it was definitely under seasoned. That being said, my kids and niece and nephew loved it, and I was happy with the moistness and texture of the chicken. Also, so easy. Probably wont make again though. I am totally going to try this next week! I purchased a turkey and will be picking it up next saturday and will be using it for this! YUM! I have the hardest time getting my daycare kiddos to try homemade goodies like this – but they go nuts over the canned stuff! My family LOVES this recipe!! I make it once or twice a month. I’ve gotten to where I don’t do it exactly as this recipe says, sometime I’ll throw some mushrooms in, use large elbow noodles, or modify to what I have on hand, but it always turns out delish!! Also, I found out that I like this much better with cream of chicken instead of the cream of mushroom, sometimes I’ll do one of each. We are a family of 4, two adults and a 5 & 3 yr old and it rarely lasts through the next day. I put everything in at the same time, liquids first, then add chicken and veggies and let it cook at least 4 hrs or until chicken is able to shred easily, if the veggies aren’t soft then I cook it longer….6hrs. I also like to use whole grain egg noodles, makes it a little healthier and they don’t get too soggy. I tried this today. I was so excited for it. But mine was no where creamy. It looks like water with boil chicken 🙁 I put every thing in. I’m not sure where I went wrong. My milk curdled 🙁 I might just add heavy cream or sour cream next time, right at the end. Disappointing. Making this for the fourth time. Everyone in my house loves it! My 7 year old even takes it in her thermos for lunch. I also “wing it” with the amounts and change up the seasonings slightly each time. Like this time I only have 3 chicken breasts, so I am cutting back a little on everything else and I had fresh basil in the house so I am using that instead of dried. Always delish either way!!!! Do I put the frozen chicken breasts in first so they are on the bottom or on top of the wet ingredients? This recipe says to do both so I’m not sure which.